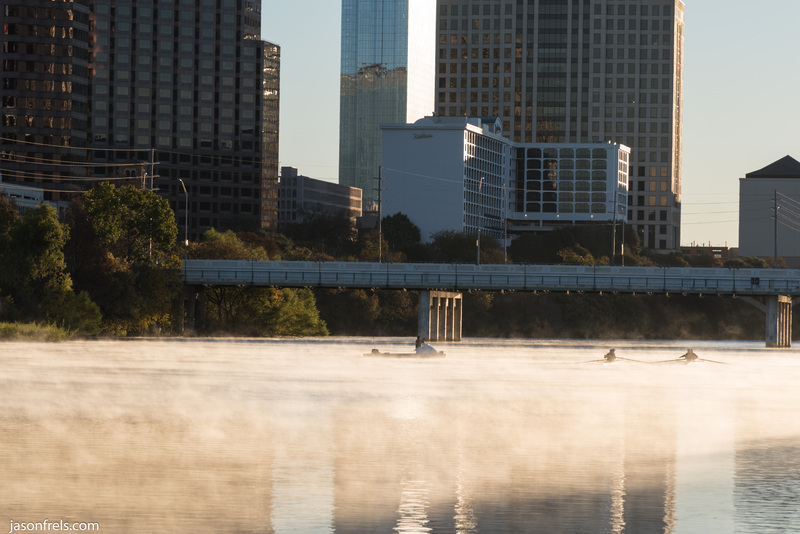 On a cold Sunday morning, I got up early and went to downtown Austin to try to get some predawn city skyline photos. It was a relatively clear morning and there was a parking garage that I wanted to try out. I like going to tall parking garages as I can just walk right in and take the elevator to the top deck and find a place to shoot photos. While this parking garage was well situated to view downtown from the North, the Capitol building was a bit obscured by another building. 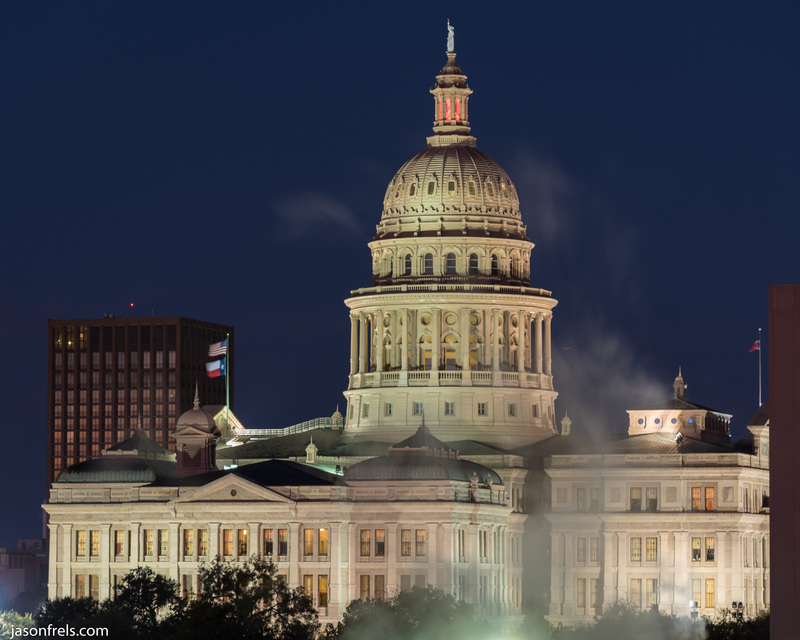 In the below image, there is a lot of steam coming up in front of the capitol and catching the flood lights. Two things that I have to remind myself to do when taking panoramas are: set the aperture at least a couple of stops down from maximum to reduce vignette in the image AND lock the exposure either by shooting in manual or using the exposure lock button. In the above panorama, I did have the aperture set to f/7.1, so no problem with lens vignette, but the exposure varies by a stop from left to right (face palm). I wasn’t very happy with the pictures that I was getting, so I decided to head down to Lady Bird Lake and catch the city by the waterside. One of the first things that I notices was the building on the far right (East) catching the rising sunlight reflected off of the building to it’s left, bathing both buildings in warm morning light. 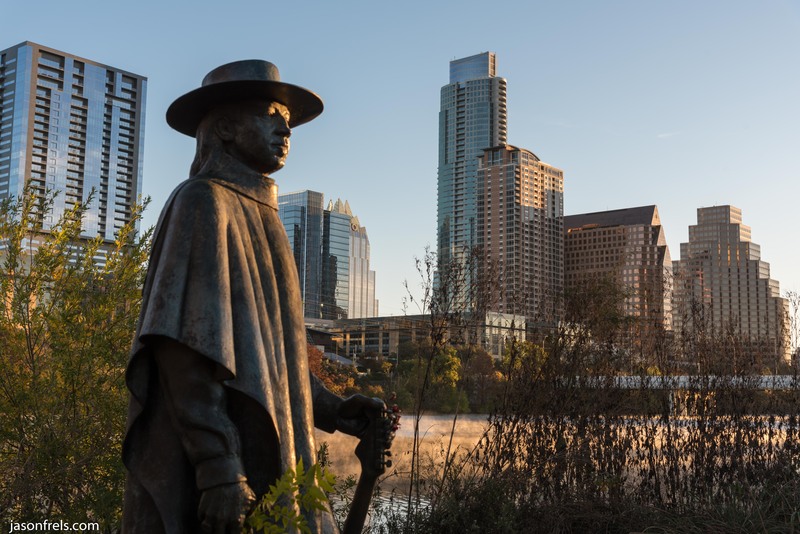 There is also a famous statue of legendary guitarist and Texas native Stevie Ray Vaughan on the shores. I hung around this statue for a while, took some mediocre pictures, and then saw the sun light start to uncover its details. Here the statue is beginning to catch the first morning light. Moving down the shore, I found a view of the buildings, trees displaying late autumn color, and an early morning mist rising off the lake, lit beautifully by the morning sun. Easily one of the best pictures of Austin I have ever taken. There was also a rowing team or two practicing on the lake in the early hours. My hands were numb from the cold at this point, I can only imagine how these guys must have felt. Once again going to downtown Austin on a nice Sunday morning rewarded me. The city is quiet and calm, little traffic or parking concerns, and no crowds in my way. All I had to do was get out of bed. If you want to photograph your beautiful city, I suggest getting down there in the pre-dawn hours of a Sunday morning. Hope you enjoyed and thanks for reading. 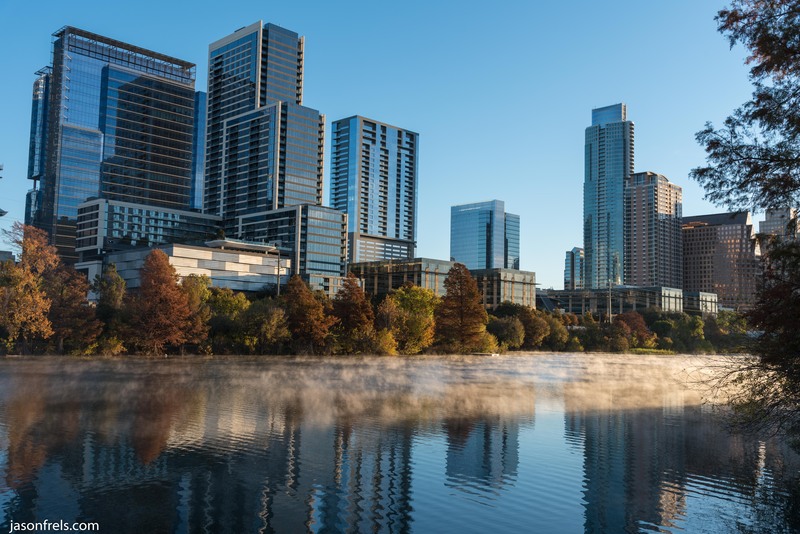 Beautiful photos, especially enjoyed the shot of the capital, the buildings with the mist on the lake and the photo of the great Stevie Ray Vaughan. Thanks, it was quite cold, but I had a fun time shooting these photos. 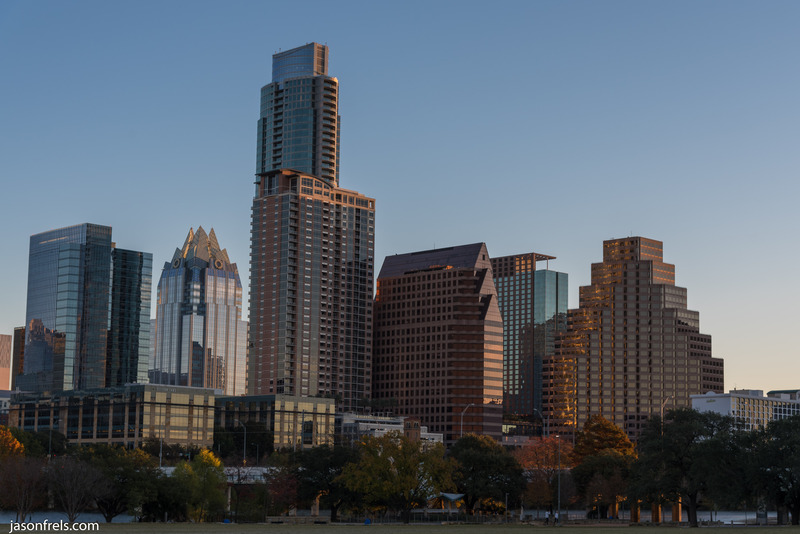 Great panorama and well done for getting up early 🙂 These days it’s hard to get decent spots for city shots but parking garages are usually a good bet. Thanks, I think I kind of messed up the panorama exposure-wise.